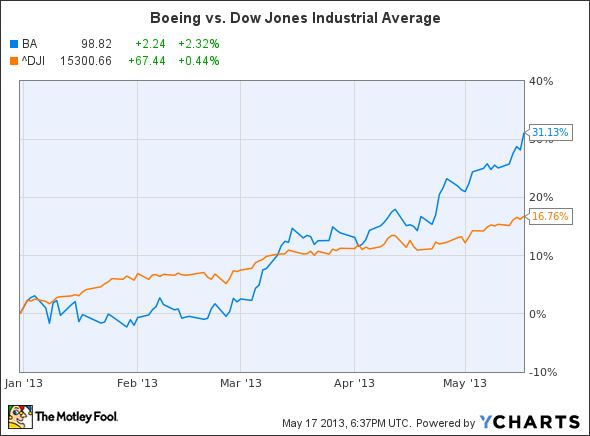 In terms of individual stocks, Boeing (NYS: BA) is among the Dow's leaders today, up by 2.3% at the time of writing. A press release issued by data analytics firm FactSet showed that the aerospace company was the "favorite allocation" of the 50 largest hedge funds in the first quarter of the year. According to the firm's analysis of 13F filings, "The stock experienced $1.6 billion in inflows, which amounted to nearly 250% of its Q4 value in the funds' aggregate portfolio." Heading lower, alternatively, are shares of Merck (NYS: MRK) , which are off by 1%. This move is also likely related to the proclivities of institutional investors. As my colleague Matt Thalman noted earlier, famed hedge-fund manager Stanley Druckenmiller liquidated the entirely of his position in the pharmaceutical company sometime during the first quarter, according to the 13F that reveals his holdings. Prior to that, it had been one of Druckenmiller's top holdings. The article Why Stocks Are Continuing Their Climb originally appeared on Fool.com. Fool contributor John Maxfield has no position in the stocks mentioned. The Motley Fool has a disclosure policy. We Fools may not all hold the same opinions, but we all believe that considering a diverse range of insights makes us better investors. Try any of our Foolish newsletter services free for 30 days.